Jennifer Braverman was once named Juniper Tree Burning, and she hates that name. It represents the childhood she escaped: her hippie mother, Faith, caught up in mind-altering salvation; her well-meaning father, Ray, interchanging kiss and slap, and her sickly little brother, Sunny Boy Blue, whom she could not save. Jennie, now a successful adult, newly married to a seemingly perfect man, Christian Braverman, is a strong, fiercely intelligent woman. She has left Juniper Tree Burning behind. All of this changes when she learns of Sunny's suicide. Whether an act of despair or revenge, her brother's final message sends Jennie running from her husband. Part love story, part family saga, and part road trip, Juniper Tree Burning is the story of Jennie's mad dash across the mountains and plains of the American West, toward the site of Sunny's death. 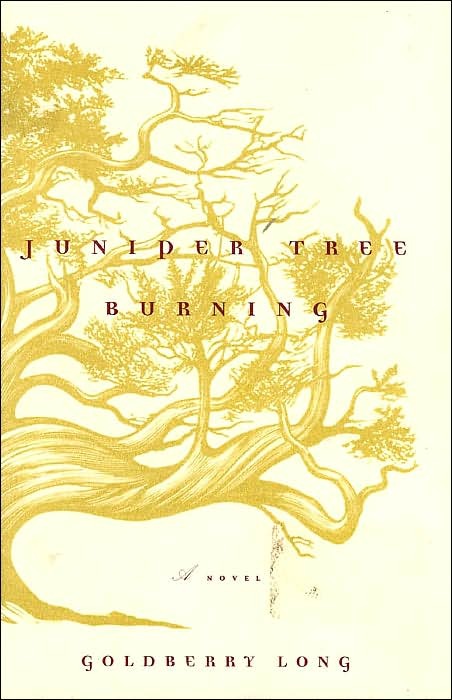 Juniper Tree Burning by Goldberry Long is a novel about the psychotic break of a woman who has always been running from her family and her past, but now has to come to terms with her younger brother's suicide. Moving back and forth in time from when Juniper was young to the present, we see the dysfunctional hippy family life she experienced growing up as Juniper Tree Burning in contrast to her current life where she is known as Jennifer. Juniper's parents use her and her younger brother, Sunny Boy Blue, as pawns in their own troubled marriage. Long moves effortlessly between the present and the past, using first and third person narratives, as the story slowly unfolds. She paints a vivid picture when describing her characters and the setting while more and more of the story is revealed. Having first read Juniper Tree Burning after it was first released, this is a reread for me. I'll have to admit that the second time was not a charm in this instance. While it is still undoubtedly a very good novel, this time around it felt overly long and Jennifer/Juniper was not quite as compelling a character and became a bit tiresome. I wanted to be the bride. I wanted to fall backwards into the comfort of normalcy, like a child in the wilderness who nestles into the snow and sleeps. I don't understand those people who want to be outside the universe of the ordinary. I was the bride, and this was enough for me. It was not snow, but a featherbed, gloriously warm and safe: it was rest.